Last year, bursting at the seams after another St. Paddy's day feast, I turned to my husband and said, "Why did I eat so much?" With the corned beef, cabbage, potatoes, and green beer, I'd slipped into a sort of post-dinner calorie-and-carb coma. St. Patrick's Day shares much in common with Mardi Gras and Thanksgiving: It's often about over-indulging as much as possible. But if you can celebrate the holiday with a scrumptious meal and still cut calories and carbs, why not? Enter my plan for this year: the Skinny Shrimp Fettuccine Alfredo recipe. 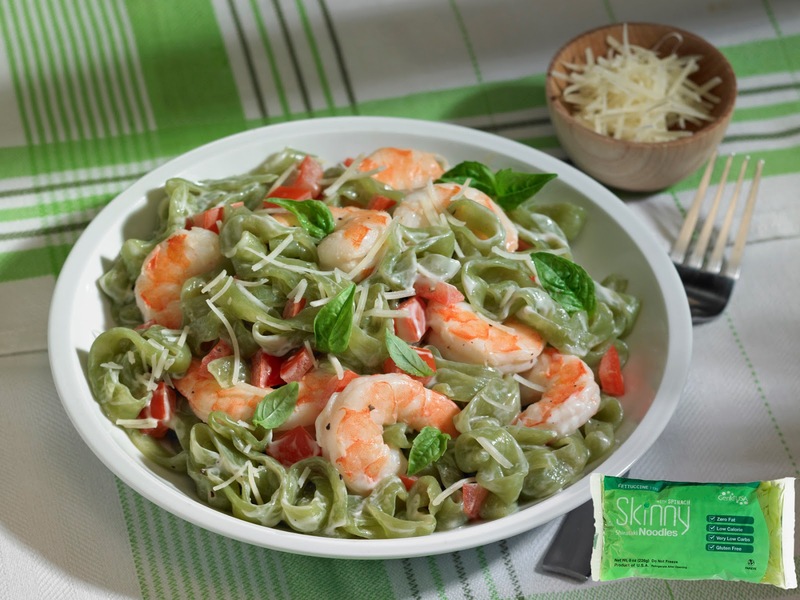 Made with low calorie, low carb Skinny Noodles Spinach Fettuccine, it certainly qualifies as abundantly green. And unlike the traditional corned beef meal, this dish has just 247 calories and 9 grams of carbs per serving. So while I enjoy a healthy meal o' green, I also get mean and lean!